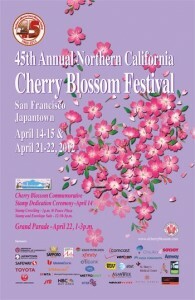 SAN FRANCISCO — The Northern California Cherry Blossom Festival, now celebrating its 45th year, is one of California’s most prominent celebrations of Asian traditions. Each year, over 200,000 people attend this dazzling display showcasing the color and grace of the Japanese culture and the diversity of the Japanese American community. 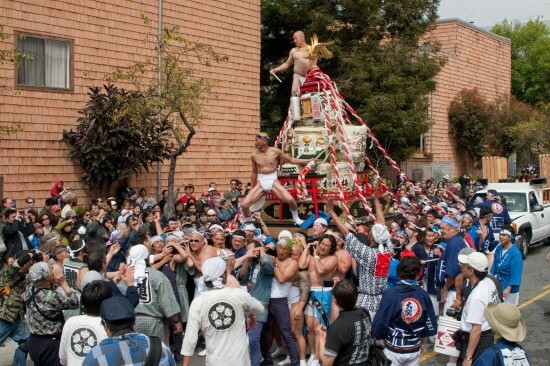 The event, which is free and open to the public, will be held on Saturday and Sunday, April 14-15 and 21-22, on Post Street between Laguna and Fillmore streets in San Francisco. The 2012 festival will celebrate the 100th anniversary of the cherry blossoms in Washington, D.C. and will pay tribute to the Japanese American soldiers of the 100th Infantry Battalion, 442nd Regimental Combat Team and the Military Intelligence Service, who received the Congressional Gold Medal last year. The one-year anniversary of the earthquake and tsunami that struck northeastern Japan will also be commemorated. The Northern California Cherry Blossom Festival is said to be the second-largest festival outside of Washington, D.C. to celebrate the blooming of cherry blossoms. It also draws attention to one of three remaining Japantowns in the United States (the others are in San Jose and Los Angeles). The five-acre Japan Center, at Post and Buchanan, and the adjacent blocks of Japantown will be filled with costumed performers and will echo with thunderous rhythms of huge taiko drums, ethereal strains of koto music, crackling of boards being splintered by martial artists, and the gentle sounds of tea ceremonies. And, wafting through and above this cultural banquet will be the delicious aromas emanating from the festival’s community-sponsored food bazaar. Thousands of Japanese American performers and behind-the-scenes coordinators will take part in the celebration along with scores of participants who will be coming from Japan to join in staging the exhibits, demonstrations, and entertainments. Classical and folk dancers will perform both weekends. Experts in karate, kendo, aikido, and judo will demonstrate their skills, and collectors of samurai swords and armor will display their treasures. There will be exhibits and demonstrations of ikebana, sumi-e, calligraphy, bonsai, origami, and doll-making. Also on the agenda are an arts and crafts fair featuring works with a Japanese theme, as well as activities planned especially for youngsters. Traditional Japanese music will fill the air at recitals spotlighting koto, shakuhachi and shamisen. There will be taiko and karaoke concerts, too, plus performances by several of the Bay Area’s most popular bands, which will add a contemporary “East meets West” dimension. A two-hour parade will bring the festival to a close on April 22. Colorfully costumed dancers and musicians by the hundreds, modern-day samurai, floats, ladies in exquisite kimonos, taiko drummers, and scores of young men and women carrying mikoshi (portable shrines) will take part in this unique procession, which begins at City Hall, Polk and McAllister streets, at 1 p.m. and winds its way along a 15-block route to Japantown. 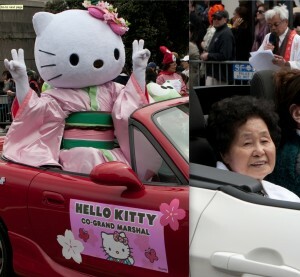 This year’s co-grand marshals are sisters Tomoye Takahashi and Martha Suzuki of the Henri and Tomoye Takahashi Charitable Foundation, who have provided generous financial support for many Japanese American community organizations in the Bay Area. Suzuki, who passed away in February, will be recognized posthumously. 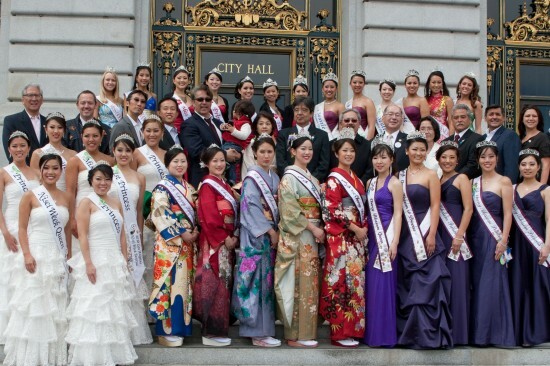 Reigning over the entire celebration will be the 2012 Cherry Blossom Queen, who will be chosen at a gala on April 14 at the Sundance Kabuki Cinemas. Queen Jeddie Kawahatsu will crown her successor. Throughout the festival, the timeless significance of sakura will be in mind. The blossoms, which stay on the trees for only a few days before the spring breezes carry them away, evoke the unsurpassed beauty of nature and the transience of life. Everyone is invited to join in the festivities, which will be in full swing by 11 a.m. each day of the two-weekend celebration. Most events are free. For a complete schedule, visit www.nccbf.org.